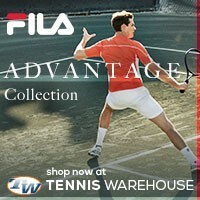 You are here: Home / Tennis Equipment / What Is New For Tennis Equipment In 2011? 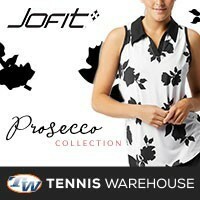 What Is New For Tennis Equipment In 2011? A new year means a new tennis season and new tennis equipment! After what seemed like a extraordinarily long 2010 tennis season (we like the feeling of a never ending tennis season), we can now look forward to all the new things that will be released in 2011 – about time right? 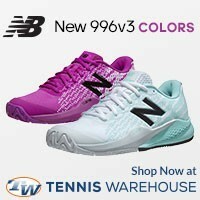 As we are in the second day of the new year, there have already been some releases in the shoe department, yep, we now know that Babolat has released the Propulse 3’s. We also have just seen a shoe release from Adidas, they have just introduced the Adizero Feather tennis shoe! According to Adidas, the Adizero has had some major changes in the sole, which now features a standard herringbone pattern, making this a more practical option for hardcourt play compared to previous versions (also gives the tennis shoe a more durable outsole). We like the functionality of this tennis shoe, however; we testers have not really been partial to Adidas tennis shoes (our own opinion – to be taken with a grain of salt). 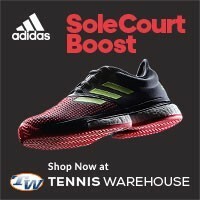 You can pick up a pair of Adidas Adizero tennis shoes from Tennis-Warehouse. There have also been some tennis racquet releases in 2011 from Wilson and Dunlop – Yonex will be releasing a new tennis racquet, but we haven’t heard any news regarding the name or price point. Wilson’s new release comes from the already popular BLX line of tennis rackets, they have introduced the Cierzo Two BLX and the Tempest Four tennis racquets. Both of these tennis racquets offer bigger head sizes (110sq inches and 120sq inches) which will allow bigger cuts at the tennis ball and will have a more forgiving sweetspot for off-center shots. Either of these tennis racquets are ideal for those older tennis players who are looking for power, feel, and spin without having the arm suffer pain. Dunlop has also released a new set of tennis frames,introducing the Biomimetic line of tennis rackets in 2011. What is this Biomimetic thing Dunlop has included in their new line of tennis racquets? According to Dunlop, nature has evolved over millions of years to become highly optimized and efficient in their chosen environment. The concept of Biomimetics is the study of nature and the natural world to inspire the design of engineering solutions and cutting edge technology. Application of Biomimetic design can be seen in a diverse range of different industries from wing design on aircraft, to design of high speed bullet trains and advanced structural engineering. Sporting examples include the super strong crash cells in Formula 1 cars inspired by honeycomb and hydrodynamic swimsuits inspired by shark skin. Dunlop has taken this concept to inspire 3 new racket technologies, creating the ultimate range of performance rackets. Uh, what? To put it in tennis terms, it’s cool and that’s all you really need to know right? If you want to try one of the Dunlop Biomimetic tennis rackets, check out Tennis-Warehouse. There are tons of other stuff that will be coming out in 2011, however; we simply don’t have access to that information – clearly it’s under a tight lid. As soon as we figure out what will be happening with the new tennis equipment, we will be sure to let you all know.